God works with time and seasons. Ecclesiastes 3:1 says “there is time for everything, and a season for every activity under the heaven:” God makes everything beautiful in its time. When the time is over, there is nothing you can do. Today, I want to talk you about embracing change in our relationships. Sometimes saying goodbye to certain people, habits or things is very difficult but embracing the change helps us to transition for God’s divine purpose. For many of us, change is traumatic. We have created a comfort zone for ourselves where we dwell. But until we make a change, and move forward, we would never experience God’s best for our lives. Change is inevitable. When the time is up for the person to leave, there is nothing you can do to let him or her stay. That is why most of us have suffered in a relationship trying to work things out for years. 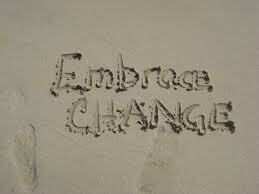 It is time to make a change and embrace the new life God has for you. Understand that some people are meant to stay with us for life, and others are but for a season. God sends some people into our lives to shape us, and help us achieve a purpose. When the season is over or when that target has been achieved, we will start to experience inconveniences with the same thing that gave us joy, happiness, etc. Some of us are in relationships that we know from within our spirits that things are not working; each day we spend in that relationship, trying to fix things, goes with pains, hurt, disappointments, tears, etc. Why do we hold on in our intimate relationships when we know it’s time to let go? Why is it so difficult to let go and embrace change? Why do we often return to that same lover hoping for a different result yet, in a matter of time we repeat the same cycle again and again? I couldn’t get any tangible answers so I understood that the season was over and I’ve got to move forward. Today I can say that God has brought wonderful people in my life that I would never have met if I had not embraced the change those times. Not all friends, family members, loved ones, business partners, pastors, mentors, boyfriends, girlfriends, would stay or be part of our journey forever. Jesus experienced the same on earth. In John 6, “66 From this time many of his disciples turned back and no longer followed him. 67 “You do not want to leave too, do you?” Jesus asked the Twelve.” Those who were not suppose to stay with Him till the end left because they were offended by His teachings. A true friend, family member, loved one, business partner, pastor, mentor, boyfriend, girlfriend, etc would not leave or walk away because he or she is fed up with your behaviour. Those who are meant to stay will stay no matter what you do or say to them. Some of us have lost dear ones and the pains are keeping them away from receiving God’s best. It is time to embrace the change and move on. God has prepared wonderful people, talented folks, etc in your future. I always tell people that our best days are ahead of us. I was listening to Joel Osteen’s message and he said a story I found very interesting and inspiring. He said a certain woman was travelling with her husband who was a mayor of a great city. They stopped at a fuel station to fill their tank. They noticed the guy who attended to them was the lady’s formal boyfriend. The man jokingly said if you had married him, your husband would have been filling people’s car tanks. The woman replied, if I had married him, he would have been the mayor by now. This is what I want to say, if that person doesn’t leave, you would miss God’s best for your life. I believe if the formal boyfriend had not left the lady, she would not have met the mayor. A closed-door means a better is opened somewhere. All you need to do is to pull yourself together and stay in faith. Others are meant to stay forever. Those are the people God bless because of us. Ruth was blessed because she chose to stay with Naomi. Today, every woman wants to be like Ruth, and not Orpah. Elisha received double portion of Elijah’s anointing. Jesus’ disciples received the Promise. Hear me today, God is blessing some people because of their relationship with you. You know; you are blessed, highly favoured, you are a king or queen on earth and a prince or princess in heaven. Because God has given you His promise; He said I will bless those that bless you. Your Father in Heaven is blessing some folks because of their association with you. Listen to what Laban said to Jacob in Genesis 30:27 “And Laban said unto him, I pray thee, if I have found favour in thine eyes, tarry: for I have learned by experience that the LORD hath blessed me for thy sake.” Like the woman told her husband that if she had married her formal boyfriend, that guy would have been the Mayor. Those people who are leaving are leaving at their own disadvantage. We are blessed and those who associate with us will forever remain blessed. Next HOW DEEP IS YOUR LOVE? Great piece. God bless you. Amen! God bless you too for visiting depreachersblog. I hope you had a nice time today. I look forward to seeing you next time. Don’t forget to tell others about De Preacher’s blog.